Plate fourteen from 'Picturesque Scenery in the Kingdom of Mysore' by James Hunter (d.1792). 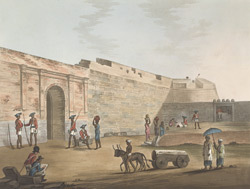 This aquatint, which is based on an original composition by Hunter, shows the Mysore Gate of the fort at Bangalore. Originally built in 1537, the fort was rebuilt out of dressed stone in 1761 by the king of Mysore, Haidar Ali (c.1722 -1782). Most of Haidar Ali's original stone fort is now gone. In the lower right corner of this picture a man is seen sketching. Perhaps this is a self portrait of James Hunter.